These translations all use as their model the English of the Bible of 1611, commonly called the King James Version in the United States, or, in places influenced by British tradition, the Authorized Version. While it is understood that this model embodies elements which have passed out of common use, most notably the familiar form of the second person singular (thee, thou) and its dependencies, these elements do not impede comprehension. Indeed, the depth of our prayer is enhanced as we familiarly address Him to Whom we owe all with these ancient pronouns of endearment; and thereby, we rekindle that spirit of son­ship, enjoined on us by the Holy Apostle, “whereby we cry Abba, Father.” It has been said that we should not use this older level of the language because we do not commonly speak this way. In every department of our life, even if we live and work alone, it is necessary for us to become conversant in many ways of using our language. We adapt to all these necessities without thought or question. It must not be that in this, the most exalted purpose for which we would “open our lips,” we would cut off as refuse the richest manifestation of our language, especially as we have in the 1611 Bible a model for our foundation and striving to which there is no superior in prayerful dignity and stateliness of expression. voices (first syllable) the voiced consonant “V” followed by two vowels “O” (“Aw”) and short “I” (“ee”). 3. Consonants at the ends of words. There is another factor which conditions the effect of individual elements of articulation. This is the relation of the individual word or syllable to its context. Consider, for example, the case of “sun”/”Son.” There being a pause at the end of the second clause, “sun” stands alone and therefore, time is needed to properly articulate the “n”. “Son” in the list of the persons of the Trinity is followed by the “short” comma discussed above which should entail no break in sound but perhaps a slight broadening of the “n.” “Son” as in “Son of God,” however, is elided to the following “o” in “of” with no impediment. This makes the “n” to function, not as an ending, but as a beginning consonant. The articulation of beginning consonants is, as it were, impelled in the act of getting the rest of the word out. we ‘ praise the ‘ Fa-ther, the ‘ Son, and the ‘ Ho-ly ‘ Spi-rit: ‘4 God. O ‘ Son of ‘ God, ‘ Giv-er of ‘4 life. ‘ Where-fore, the ‘ world doth ‘ 1 glo- 1 ri- 2 fy ‘4 Thee. In addition to the reciting note, each phrase of a sticheron melody contains at least one melodic “stress." It may contain two. Melodic stresses are at the ends of phrases, enclosing the reciting note. They may be characterized by broadened note values, melismas or multiple note values per syllable, or a simple change of pitch. There may be other characteristic turns of melody which build toward or recede from the stress. These we will call “flex.” To aid in the conceptualization of all this as it relates to each tone, the texts of all stichera are pointed, or marked, with indicative type style alterations. Every syllable which is associated with a stress is set in bold type. Every syllable which is associated with a flex is set in italic type. Once the melodies of the tones are learned and the associations are established, they may be recognized by this “typographical shadow.” In future volumes of this collection, since the emphasis will shift away from the learning of stichera, these type faces will be used without musical notation where stichera to these melodies are called for. The melody for tone 4 has six phrases. Phrases 1 and 2 are used for the first two phrases of text. Phrases 3 through 5 are used in rotation as the test requires. When phrase 3 recurs after phrase 5, it begins on the reciting note. See this illustrated in the Dogmatic Theotokion (p. 118). Care must be taken not to stretch too much the melismatic flourish in phrase 5. It's rendering should convey a sense of sweep. The melody for tone 6 has four phrases. Phrases 1 through 3 are used in rotation as the text requires. Phrase 2 ends with a descent if it is used for the second-to-last phrase of text. See this illustrated in the phrase "when I cry unto Thee" (p. 159.) Phrase 4 is used for the last phrase of text. As with tones 4 and 5, beware of dragging the flourish in phrase 3. One common element in the traditional application of harmony to the melodies of the tones is the presence of a part that moves in parallel thirds (sixths) with the chant melody. The parallel part is called the “descant” in the main introduction. This practice was strictly adhered to in the initial edition and the practice is retained in its entirety in this revision. Mention of this arises because of a point made in the comments, which is, that in the cases of a few tones. in mixed choir situations, where the soprano has the melody and the tenor has the descant, the descant is occasionally adjusted from the strict parallel motion for the sake of sonority and, to a lesser extent, considerations of voice leading. These considerations are over-ridden by yet another guiding principle of the book, which is, immediate adaptability to multiple choir configurations. Again, it was reasoned that the intended users of the book would welcome adherence to this principle, and this has been borne out by their favorable responses. The main feature of this revision is the rearrangement of the contents of the book. This rearrangement means that, in the course of its use in Vespers, one will never have to turn back to a previous page. This result was arrived at by re-grouping the sections containing stichera and troparia. The main framework is that all the stichera (or troparia) for all tones precede all the theotokia for all tones. For example, in ‘Lord, I have cried,’ in the first edition, the stichera for Tone 1 with the appropriate verses were followed by the psalm verses by themselves for Tone 1, followed by the Dogmatic Theotokion for tone 1, followed by the stichera for Tone 2, etc. 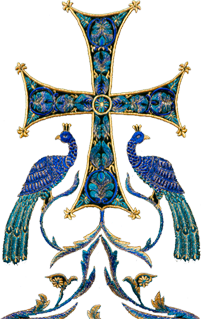 In this revision, Tone 1 stichera are followed by Tone 2 stichera,...followed by tone 8 stichera, followed by the psalm verses for all Tones, followed by the Dogmatic Theotokia for all Tones. The psalm verse section is so configured that all the melodies of the tones for each verse of text are presented on facing pages. For example, all the melodies, tones 1 through 8, for “Bring my soul out of prison....” are on facing pages, 1-4 on the left, 5-8 on the right. It remains only to mention those without whose help the book would not have been produced. Locally, Claire Mendis, Natalia Mulligan, and Mary Baumann contributed greatly to the editing and physical preparation of the book. 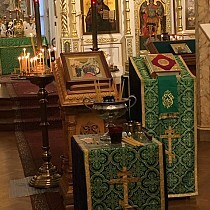 Dr. Vladimir Morosan and Dr. Nicholas Schidlovsky, recognized experts in the field of Russian Liturgical music, provided much helpful comment and encouragement The Liturgical Music Advisory Board of the Russian Orthodox Church Outside of Russia, under the prayerful nurture and blessing of Metropolitan Laurus, are here gratefully acknowledged for their contribution. Reader Nicholas Park came up with the idea of how to arrange the material for the greatest usefulness. Last, but really first because it is for whom the effort is made, the choir members who have been the ground for testing and proving the material must be held up in gratitude for all they have done (not to say, put up with) down the years.